Not to be confused with Grande Couronne or Grand Couronné. 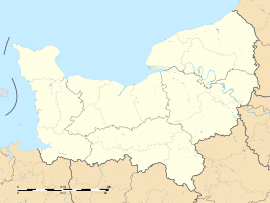 Grand-Couronne is a commune in the Seine-Maritime department in the Normandy region in northern France. A small suburban town with a huge container port and considerable light industry situated by the banks of the river Seine, some 7 miles (11 km) south of the centre of Rouen, at the junction of the D938, D3 and the D13 roads. The A13 autoroute passes through the southern section of the commune’s territory. A menhir in Milthuit woods, evidence of the presence of a neolithic population. The church of St.Martin, dating from the fourteenth century. The church of St.Antoine, dating from the nineteenth century. The chateau of Grésil . The remains of a Benedictine priory. Wikimedia Commons has media related to Grand-Couronne. This page was last edited on 20 May 2018, at 20:17 (UTC).